RANGE magazine Freedom of the Press Award | RANGEfire! The Nevada Press Association recognized journalistic excellence on September 24 during its annual convention in Mesquite and conveyed major awards upon RANGE magazine. RANGE received 13 awards: seven first places, three seconds, and two thirds. The first-place awards include the coveted Freedom of the Press Award, which makes the fourth consecutive time judges have recognized RANGE with the special award. The Arizona Press Association judged the competition. On September 25, 2016, RANGE magazine received a fourth consecutive Freedom of the Press Award, this time for its special report on the “The Grass March Cowboy Express,” and the under-reporter death of Grass March leader Grant Gerber. In 2013, the magazine was recognized for its first award for reporting the history and courtroom proceedings in the 5th Amendment case Hage v. U.S., a 35-year legal battle involving a Nevada ranching family. The second in 2014, involved coverage of climate change and Agenda 21, followed in 2015, and coverage of the Cliven Bundy Nevada standoff. The Nevada Press Association (NPA) is the formal member trade organization for news publications in the state of Nevada. It is a voluntary nonprofit organization that represents daily and weekly newspapers in Nevada and the Lake Tahoe region of Northern California, as well as magazines and two online news services. FREEDOM OF THE PRESS is a major editorial recognition awarded for upholding the principals of the First Amendment and protecting the public’s right to know. 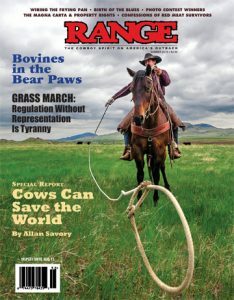 RANGE received the most recent Freedom award based on its coverage of “The Grass March Cowboy Express,” in the Summer 2015 edition. His last battle was to lead a coast-to-coast horseback ride of 11 men and women carrying a pouch to Congress containing petitions from several states addressing grievances, a saga that was both heroic and tragic. Gerber, by spearheading the March, was representing all ranchers trying to cope with government overreach, unreasonable rules and policies, and federal agencies in lockstep with greedy special-interest groups. Gerber’s intentions were honorable—and still are—which is why RANGE is speaking out for Gerber and the other courageous Grass March participants. The Grass March itself was under-reported—media found it tame compared to the more salacious drama of the Bundy standoff. A horse wreck in Kansas left him with a concussion and an eventual brain bleed. He continued to Washington, D.C., delivered the petitions to Congress, and headed home—making it to Salt Lake City after being told in hospitals in Laramie and Cheyenne that he needed surgery and to continue to the University of Utah hospital. On the way to Utah, Gerber talked nonstop, advising his fellow riders on which books to read and offering advice that would help continue the fight to protect their livelihoods in the most effective way. Grant Gerber died on Oct. 25, 2014—a man worth remembering. Honest. Caring. Selfless. 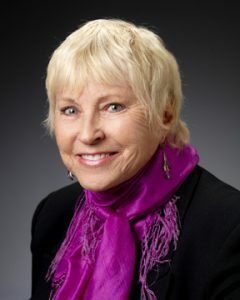 Contributing writers to the Grass March report include: Jameson Parker, former Hollywood actor and author, introduction; “The Riders” and “The Muscle,” Julian Stone, frequent RANGE contributor and national freelance writer; and “The Leader” and “The Last Best Hope” sidebars, Carolyn Dufurrena, Nevada rancher, author, teacher and award-winning writer. R ANGE editor and publisher C.J. Hadley included a special report on the Grass March to share information and promote understanding about the difficulties faced by people who live and work on the land who help feed more than 300 million Americans. The special report explained the sacrifice made by Grant Gerber. RANGE and Hadley, who has been called “feisty” upon occasion, have chosen to be the editorial voice and advocate for the issues important to Americans—issues that are not always popular, and sometimes hard on the magazine’s bottom line. C.J. Hadley, publisher/editor RANGE magazine, which was awarded a fourth consecutive Freedom of the Press Award by the Nevada Press Association. RANGE follows the politics affecting America’s food supply—politics and decisions in the coming months and years that could have a disastrous impact because of seemingly limitless new pending regulations, says Hadley. Bureaucrats may view such issues to be of marginal importance. This has, and will always be, unacceptable to RANGE. The public has the right to know how its business is being conducted, even from the middle of nowhere—Nevada. 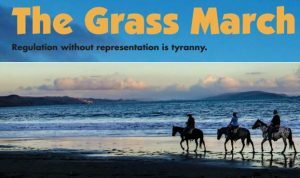 In April 2016, rancher John Klump offered George Martin, one of the Grass Marchers, a public service billboard relating to the Grass March. A resource was needed for people to go for more information, which brought RANGE magazine into the picture. So began a chain of companies and caring people wanting to keep the memory of the Grass March alive. The billboard is on Klump’s ranch on Interstate 10 in Bowie, Ariz., around the 367-mile marker. It bears the image of a horse emblazoned with the word “Tyranny,” and directs those wanting to know more to the RANGE website at www.rangemagazine.com. Supporters and friends of Grant Gerber and his mission to protect ranchers are grateful to the rancher for stepping up to help keep Gerber’s dream alive. The history of the NPA dates back to 1888, when an association of Nevada newspapers was first organized. Mark Twain, who was working as a reporter at the Territorial Enterprise in Virginia City, was a founding member and was named to the NPA Hall of Fame.